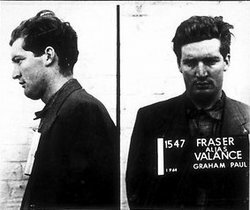 On this date in 1964, Glen Sabre Valance became the last person hanged in South Australia. Born Paul Fraser, he jazzed up the handle by cribbing the surname of the title outlaw from the 1962 John Ford Western The Man Who Shot Liberty Valance. Like that Lee Marvin cutthroat, “Glen Valance” was destined to live a brutal life with a violent end. In the early morning of 16 June 1964, the 21-year-old Valance broke into the home of his former employer, Richard Strang. He had a standing dispute with the Bordertown farmer over wages but his real grudge ran deeper than that. Strang had bemusedly read the sensitive youth’s diary to other farmhands weeks before, resulting in an altercation — and, after Valance drove off with some of his effects, a police report and an arrest. Valance nursed “bad thoughts” against his tormenter, he muttered to his family. They turned out worse than anyone could have expected: bad enough to justify his adopted alias. As Strang and his wife dozed in bed, Valance leveled his rifle at the hated ex-boss, and leveled the score. Then he seized the waking Suzanne Strang and raped her there in the bed sodden with the gore of her husband’s warm corpse. As Valance hightailed it out of Kooroon Station, Suzanne Strang phoned police — and the resulting roadblocks snared the murderer that very day, with the murder weapon right there in the passenger seat … actually riding shotgun. Valance mounted an unsuccessful insanity defense. 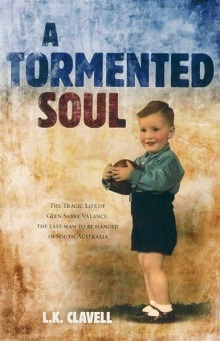 In 2011, Lillian Clavell — ten years old at the time of her half-brother’s execution — published a book, A Tormented Soul: The Tragic Life of Glen Sabre Valance, the Last Man to be Hanged in South Australia. I know she burnt his hands on the stove. I know she put his face through a window. Once she held a knife to his throat and said she’d kill him if he ever stole anything from the cupboard again. I believe that (abuse) led very much to his crime. Valance was hanged in an unused guard tower (the “Hanging Tower”) of Adelaide Gaol. The facility is unused today, but the date November 24, 1964 and the letters GSV still remain printed on the brick wall.